Santini Tate, 18, of Riverside was arrested on suspicion of strong-arm robbery after robbing two young sisters at their lemonade stand in Rancho Cucamonga Wednesday, July 15, 2015. 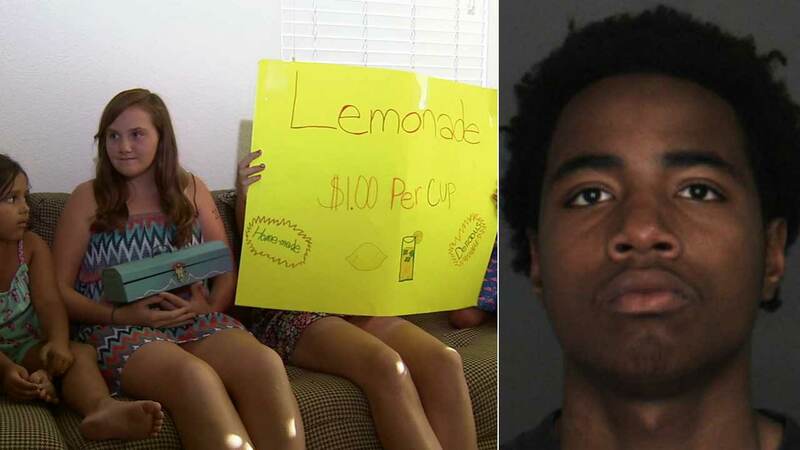 RANCHO CUCAMONGA, Calif. (KGO) -- An 18-year-old man was arrested after robbing two young sisters at their lemonade stand in Rancho Cucamonga on Wednesday. The incident occurred near Mountain View Drive and Terra Vista Parkway at about 3:45 p.m. The suspect, 18-year-old Santini Tate of Riverside, approached the girls and said he had no cash, but wanted some lemonade. The girls gave Tate a free cup of lemonade and he began to walk away. Moments later, he turned around, pushed over the lemonade stand and grabbed the girls' money box. A jogger called police, while the girls' brother and a friend confronted the suspect. They were able to recover the empty money box. "He caught our eyes looking at him and he just started running and we chased after him," said Keiran Anderson, the brother's friend. A sheriff's deputy responded to the area and arrested Tate within minutes. He was carrying $30 from the lemonade stand. Julie Jacobs, one of the two girls at the lemonade stand said, "I was scared, because I didn't know what he would do if we went off running after him." The suspect was booked at the West Valley Detention Center for strong-arm robbery. Authorities say he may be connected to other crimes which were committed earlier in the day.